December 12, 2013 - Eric Nadel, ASA member and longtime radio voice of the Texas Rangers, has been named the winner of the 2014 Ford C. Frick Award by the National Baseball Hall of Fame. He will receive his honor on July 26th during the annual Hall of Fame induction weekend in Cooperstown, NY. This was Nadel’s fourth time as a finalist. He was chosen over fellow broadcsting greats Joe Castiglione, Jacques Doucet, Ken Harrelson, Bill King, Duane Kuiper, Eduardo Ortega, Mike Shannon, Dewayne Staats and Pete van Wieren. "I'm so excited," Nadel said in a conference call after the announcement at the Winter Meetings on Wednesday morning. "I'm happy, tremendously flattered. It's an amazing thrill for a kid from Brooklyn, who grew up as a radio junkie. I'm still a radio junkie, I guess. When I think of the fact that six of the former winners I grew up listening to and idolizing, several others I consider to be friends -- and some of them are mentors, it's just mind-boggling to me that I'm now being placed in the same category as them." Nadel honed his craft calling football and hockey while attending Brown University. 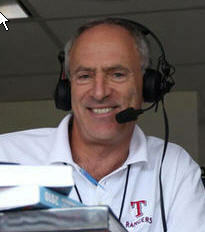 After several stints doing minor league hockey play-by-play in Muskegon, Oklahoma City and Dallas, Nadel was hired by the Rangers in 1979 and worked both the radio and TV side. After a 13-year run with partner Mark Holtz on WBAP Radio, Nadel assumed the lead radio position in 1995 when the team moved to KRLD and Holtz made the switch to television. He has also shared the booth with Brad Sham, Vince Cotroneo, Victor Rojas, Dave Barnett and his current KESN Radio partner Matt Hicks. Among his most memorable moments were Nolan Ryan's 5000th strikeout in 1989, the Rangers' 30-run explosion in 2007, the Rangers beating the Yankees to clinch their first-ever AL Pennant in 2010 and their second consecutive Pennant in 2011. In 2006, Nadel signed a "lifetime contract" with the Rangers, allowing him to continue on their broadcast team until he chooses to retire. The 2014 baseball season will mark Nadel’s 20th year as the lead voice on radio broadcasts and 36th year of broadcasting Rangers baseball. It's the longest tenure of any announcer in the history of the franchise and the second-longest continuous current stint with one team in the American League. Among his many honors, Nadel was inducted into the Rangers Hall of Fame in 2012.